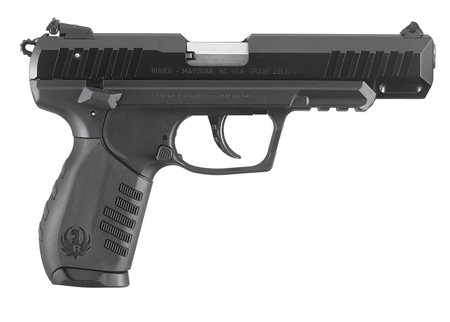 Offers a 4.50 inch barrel and a similarly extended slide. Built on a black polymer frame, aluminum slide with serrations and black anodized finish. Fixed white dot front sight and adjustable rear sight. Reversible blade allows selection of two white dots or black blade. Picatinny rail with multiple cross slots on underside of frame. Two interchangeable rubberized grips with serrations (no tools required to change). Ambidextrous manual safety, decocking lever and magazine release. Includes two 10-round magazines, two finger grip extension floorplates.